As part of our international development, we are committed to the indispensable modernity associated with the evolution of new means of communication and are naturally able to offer videoconferencing assistance to our clients wherever they are based. The firm had always had a very close tie in the African continent. Today, Africa is attracting more and more Western expatriates but also exchanges transnational skills because many investment projects are underway. French groups and international companies are well aware of the powerful dynamic of growth advancing in that continent and many want to establish themselves in there. However, it is not enough to have an economic interest to develop its activity in good conditions right on the spot. Nevertheless, specialized support is essential in order to fully progress in the local legal system. With a recognized expertise in consulting and litigation, particularly dedicated to our international clients operating in member states of OHADA law, we offer specific assistance by personally intervening on-site. 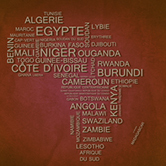 In addition, in order to ensure qualitative legal assistance adapted to the particularities of national laws, our firm is also able to rely on its local partners (consultants, notaries and judicial officers) through the AFRICA LAWS network present all over Africa.